The Althorp Living History collection of furniture is based on the antique furniture from Princess Diana’s ancestral home in England. We are delighted that we are now supplying this elegant collection to our customers. Each piece is beautifully hand-crafted by Theodore Alexander furniture makers. 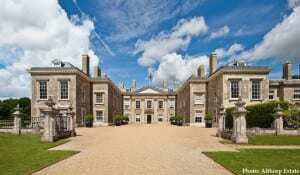 This is Althorp, the childhood home and final resting place of the late Diana Spencer, Princess of Wales. 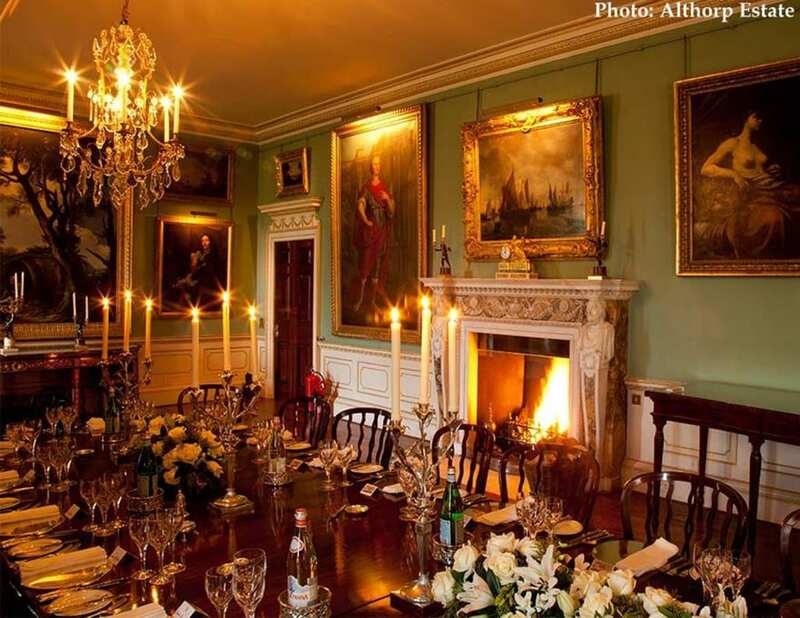 Her brother Charles, the 9th Earl Spencer, still lives there and he has allowed Theodore Alexander access to make the Althorp furniture collection. The house was built in 1508 by the Spencer family, set in 550 acres of parkland near Northampton, 70 miles north of London. Althorp has 90 rooms that are all beautifully decorated with antiques added to the house by generations of Princess Diana’s ancestors over five centuries. This is the Marlborough Room. The Victorian rosewood dining table pulls extends to seat up to 42 guests! Every piece in the Theodore Alexander Althorp furniture collection is either an exact reproduction of furniture in the Althorp estate, or is inspired by it. What an amazing and exciting challenge that must have been for the master craftsmen at Theodore Alexander! These pieces, like all Theodore Alexander furniture, are hand-crafted with superb finishes. 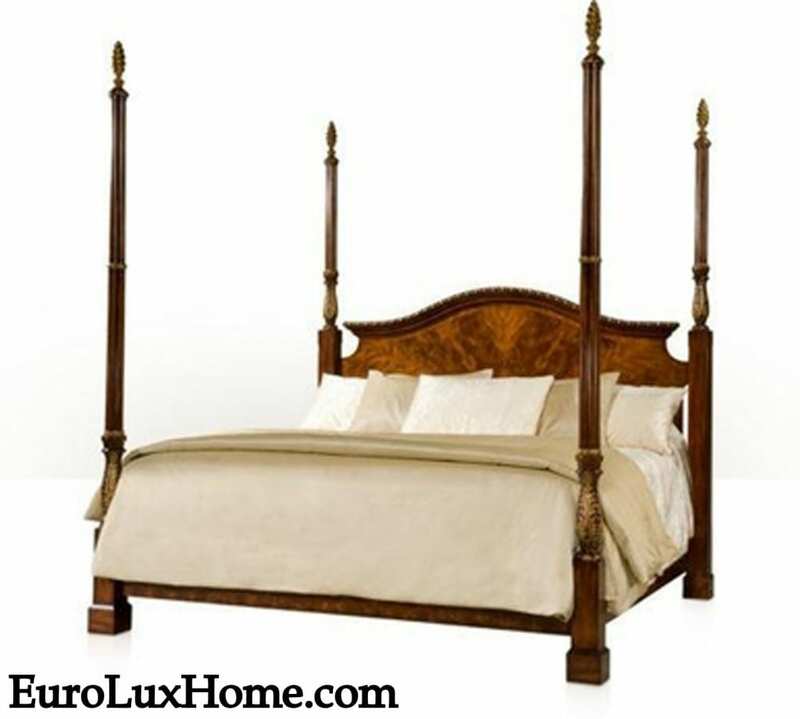 For example, this four-poster Althorp bed in the style of George III is crafted in handsome mahogany with a gorgeous flame mahogany veneer design and brass accents. 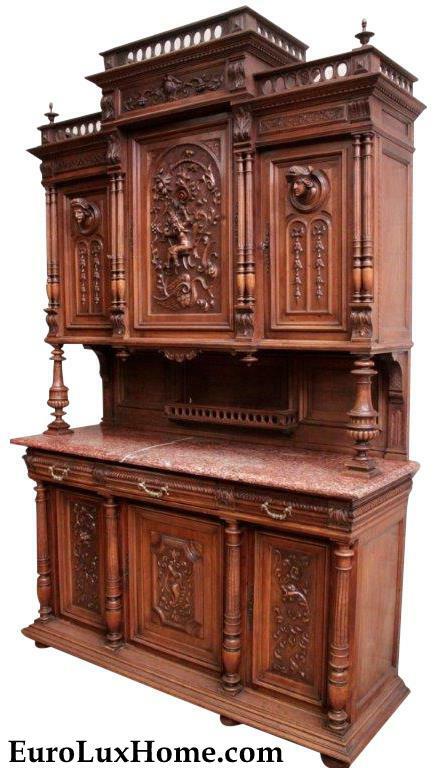 The acanthus leaf motif, carved columns and spiral pine cone finials create a very luxurious impression. This Althorp Living History desk is an absolutely darling piece of furniture. 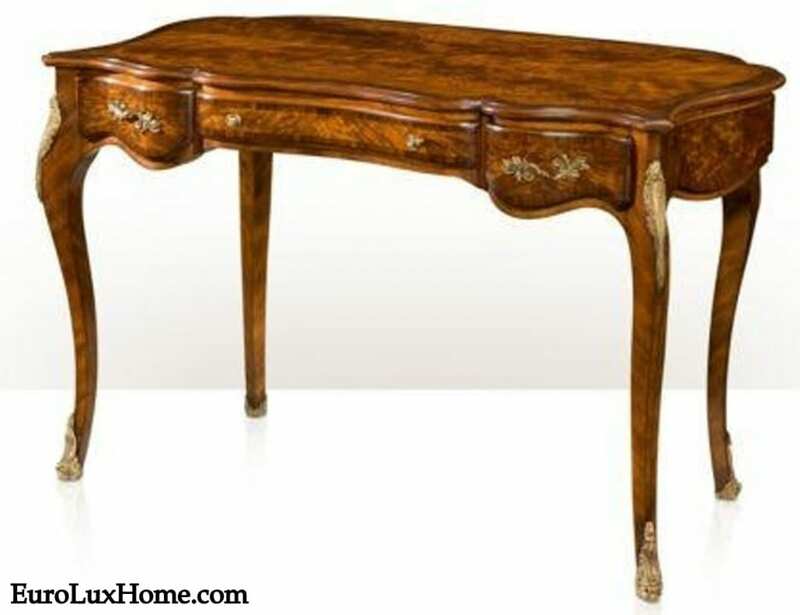 Imagine sitting down before the Louis XV Rococo style desk to write your journal or your correspondence! This fine Althorp desk is crafted in mahogany and rosewood with cast brass accents on the cabriole legs. The serpentine top adds to the seductive appeal! You will have a great conversational starter when you welcome your guests to take a seat in this Theodore Alexander Althorp settee! Your friends will love to hear the story of its origins. 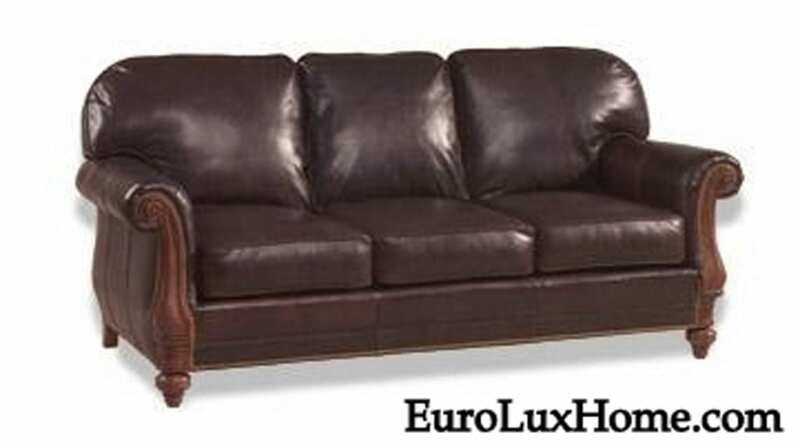 The mahogany settee with leather upholstery is crafted in the Georgian style with shapely cabriole legs and a waisted back. 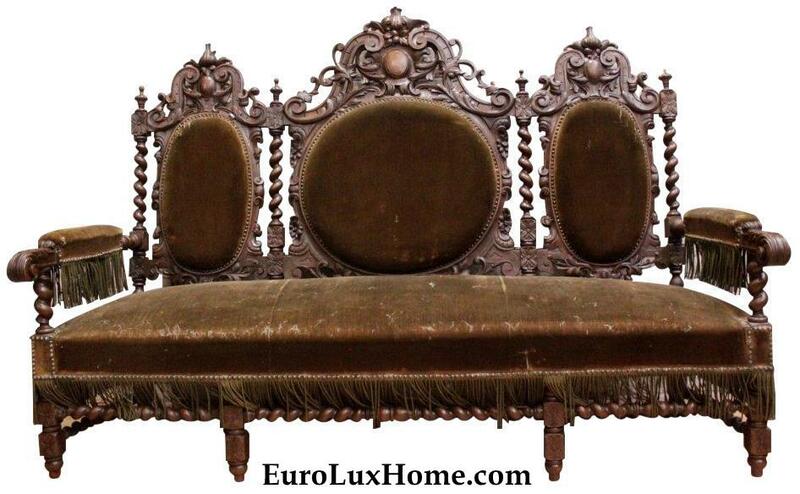 It’s a charming settee and a real steal on the price for a settee with such a fine heritage. At time of writing it is $1759 with our always free shipping. It’s an honor to supply this regal line of Theodore Alexander Althorp Living History furniture and home accessories to our customers. 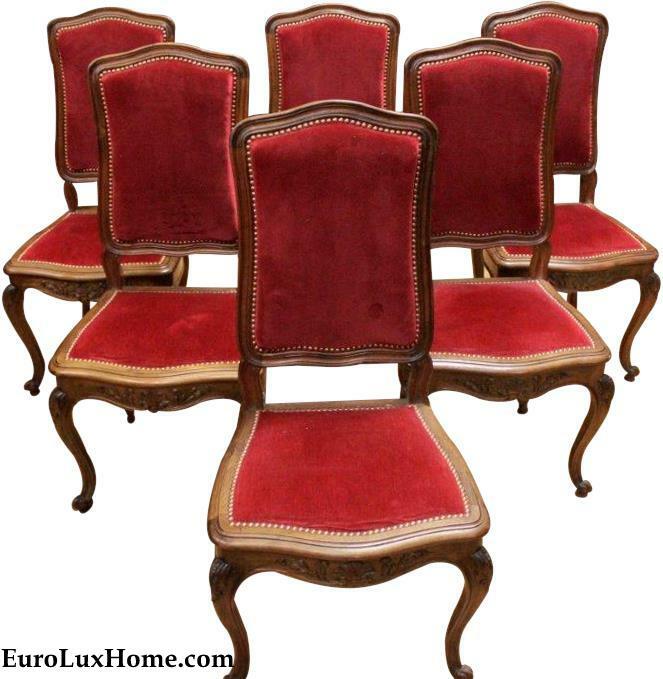 We hope you will browse our Althorp furniture here and let your imagination take flight! This entry was posted in Home Design Ideas, News and tagged Althorp Living History Furniture, antique inspired furniture, bedroom furniture, expert craftsmanship, high quality reproduction furniture, Historic House, sofas and settees, Theodore Alexander on June 19, 2017 by admin. 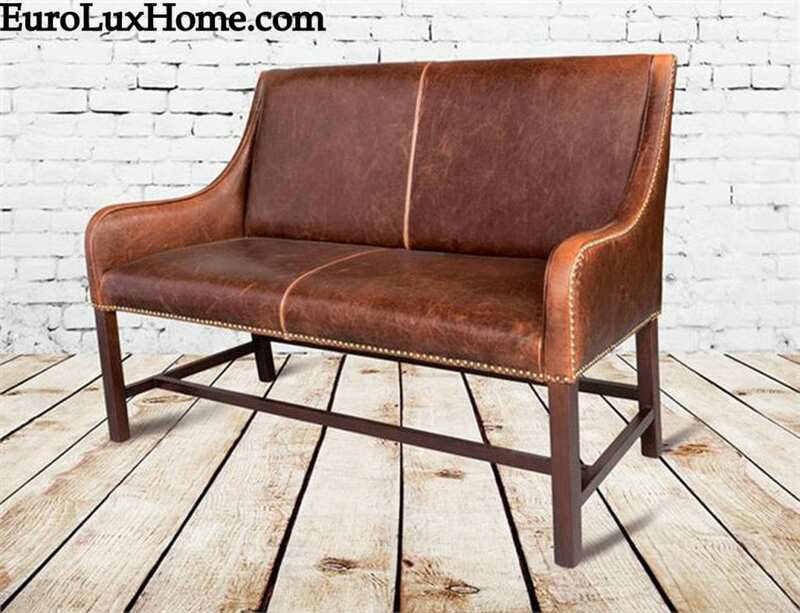 In my recent customer spotlight about interior designer Charity and the new antiqued leather settee she bought from us, I mentioned that leather sofas, chairs, stools and benches are among our top sellers. One of the leather furniture makers that we work with is a small family business, and they gave me some great info about the different types of leather and the care of leather. 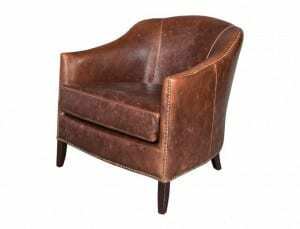 Both cuts of leather are true 100% leather and each one is wonderful for different purposes, looks, type of furniture and price points. The top-grain is the cut from the hair side of the leather. It is the most common type of leather used in high-end leather products as it is smooth and pliable. The traditional top-grain leather look is shiny and smooth and soft to the touch, with natural color and texture variations. 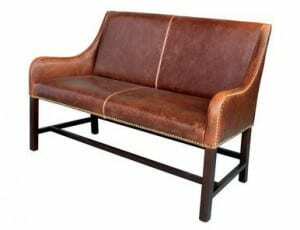 Many of our sofas and chairs are top-grain leather. The split-grain is from the flesh side. 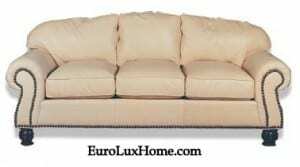 It is a tougher and thicker cut of leather and it is usually at a slightly lower price point. After the split is made, this layer of leather has a fuzzy suede look on both sides and it is light in color. Then it is finished to give it the look and feel of top-grain leather. Usually this includes applying color and a clear protective top coat. Leather is porous and it’s made up of around 12-14% water which keeps it so luxuriously supple. 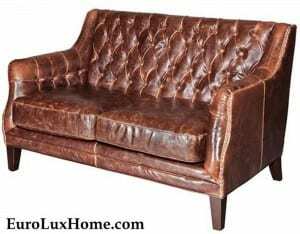 But even though it is such a sturdy and timeless upholstery material, you do need to avoid things that will dry the leather out. For example, it’s best to keep it away from a heater or from direct sun right beneath a window. 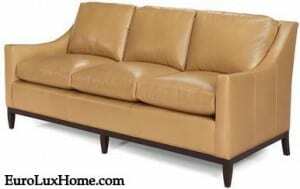 To clean leather furniture, only use a water based leather cleaner. Before my leather lesson from the furniture makers, I didn’t know how bad the leather conditioners are that you can buy in supermarkets and chain stores. I never thought about it for leather, but it is just like all of those furniture sprays that are also bad for your furniture and create a waxy build-up. My leather expert said never to use regular household products to clean and care for leather. This includes products containing oils, waxes or silicones, as they dry out the leather big time! Most “conditioners” contain waxes or oils while furniture polish contains silicones. These all ruin the leather finish. Car cleaners with oils or waxes can leave residue that acts like a magnet to dirt, creating a build-up and finally cracking of the leather. Chemicals in many leather wipes also destroy the finish and dry out the hide so it peels. Baby wipes are terrible for leather too as is dishwashing liquid as it has a high salt content and will ruin your finish. What about Saddle Soap? That should be OK, right? Wrong! The finish on beautiful leather furniture is not the same as saddle leather, so keep the saddle soap in the stable! After cleaning with a water based leather cleaner and nothing else, treat the leather furniture with a good water based leather protector. This creates a protective barrier, preventing dirt and stains from soaking into the leather. Regularly wiping the leather with a damp cloth helps to clean dirt and body oils from the furniture in addition to helping rehydrate the leather – it’s nature’s own moisturizer! 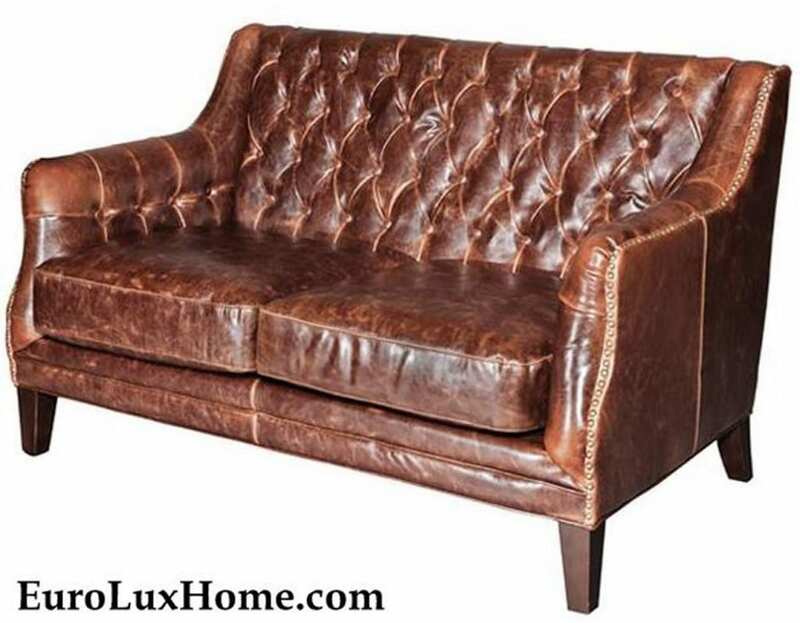 Take care of your top-grain or split-grain leather furniture and it will be look handsome and feel great for years! 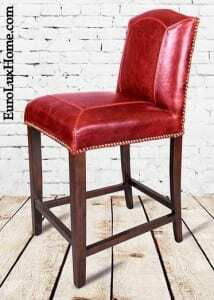 This entry was posted in News, Restoration Tips & Tricks and tagged antique inspired furniture, Antique Reproduction Furniture, club chair, counter stool, Leather furniture, sofas and settees on June 14, 2016 by admin. As Charity is an interior designer, she obviously saw the style, quality and superb attention to detail in the antiqued leather settee. She ordered it for her client in the Financial Services industry. Here it is in her client’s high rise office building in Chicago. The building had very stringent requirements for delivery, but our white glove carrier, Sun Delivery, made it happen! I have to show off a couple of other pieces made by the same small family-owned company. These are also very popular with our customers. 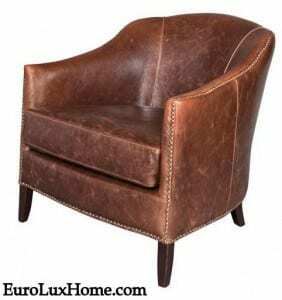 The first is this comfy new leather club chair, which would pair very nicely with the leather settee. Sturdily crafted with a solid wood frame, the Madison accent chair also boasts a luxurious hand-applied nailhead trim to highlight the curved shape. As an alternative to the more relaxed Chesterfield style settee, this elegant Manchester Antique Saddle Leather settee has been wowing our customers! In addition to our satisfied customers who have bought it, an incredible 271 people so far have saved it to their Houzz Ideabook. Everyone loves it, probably because of the graceful lines and high-quality craftsmanship. 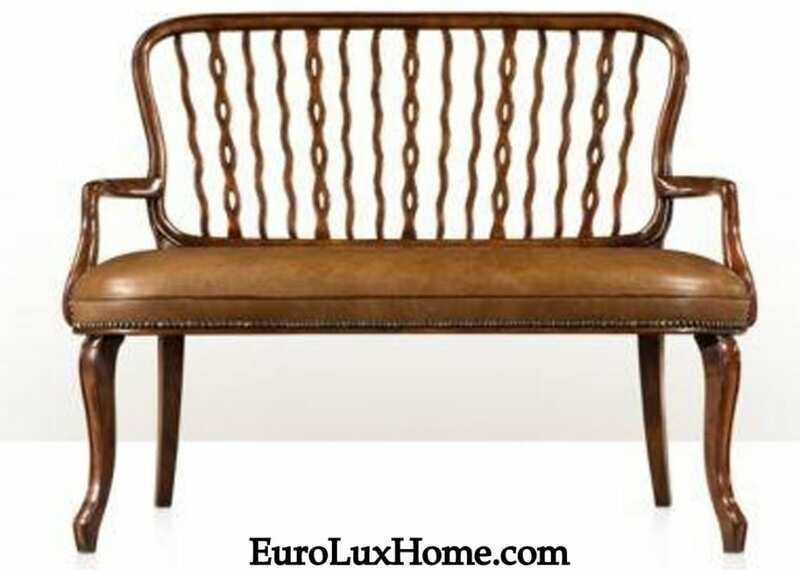 It’s perfect for an entryway or as seating in your dining room or living room. 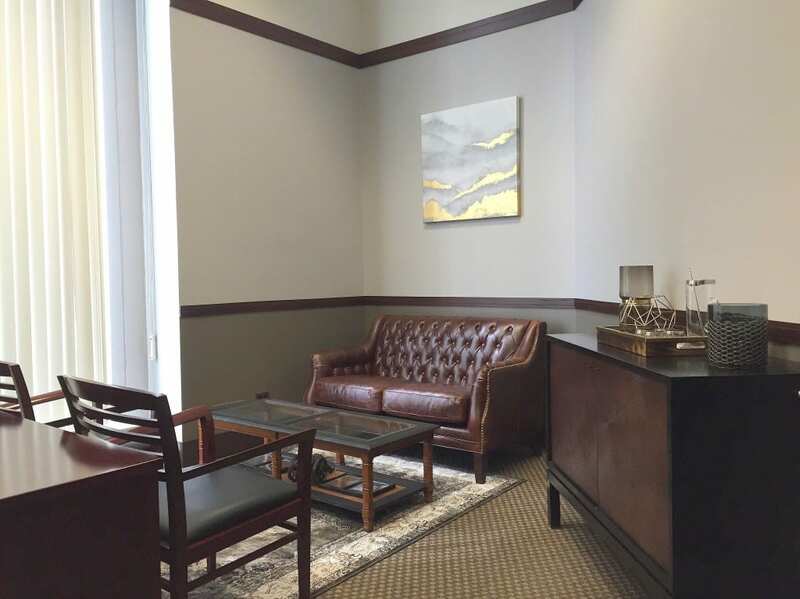 Thank you Charity for sending us the photo of the settee in your client’s office. We hope that they love the blend of styles as much as we do. 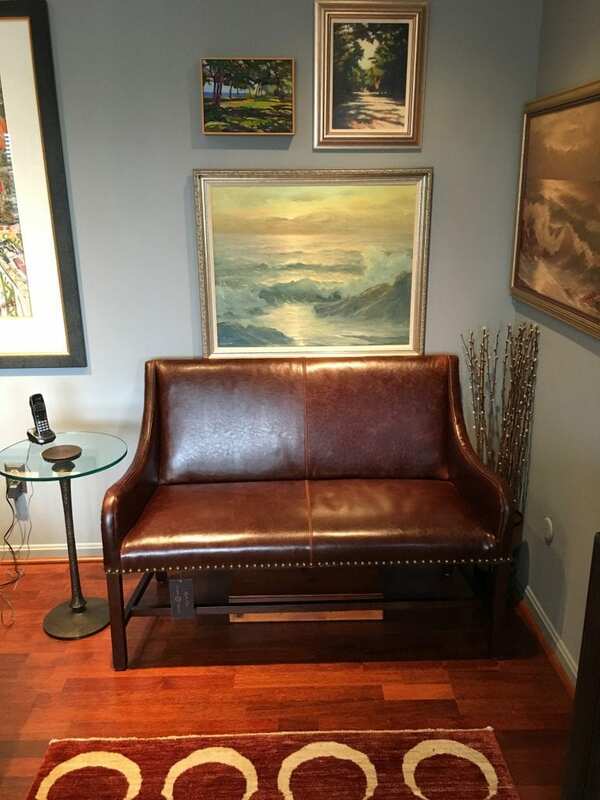 An antiqued leather settee in a modern office will always make a great impression! 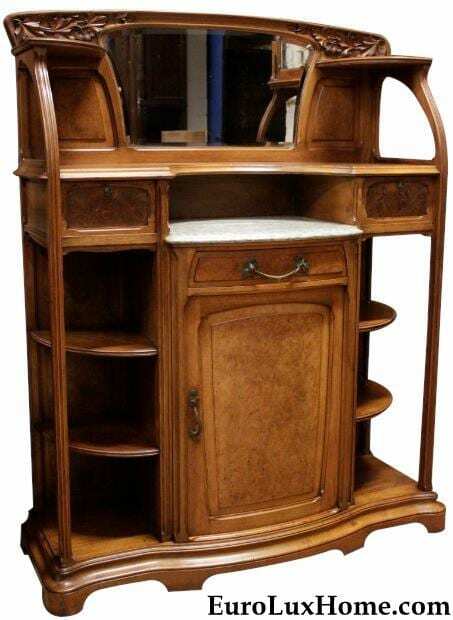 This entry was posted in Client Spotlight and tagged antique inspired furniture, high quality reproduction furniture, Leather furniture, sofas and settees, traditional home on April 29, 2016 by admin.